A post on Tuesday?!? Maybe because I'm trapped in my house due to a foot of snow! Actually, I was honored to be asked by Jodie at Jodie's Touch Of Style to co-host this month's Ageless Style Link Up. 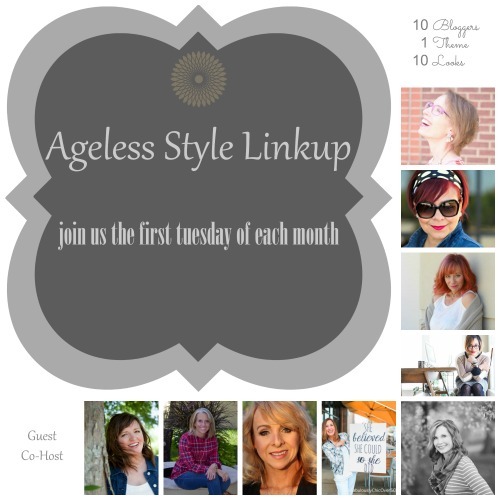 These ten fabulous, stylish ladies gather once a month to share their takes on a fashion prompt. This time the theme is "puffer", which is perfect for me, because I have a LOT of puffer in my closet. It's the perfect layer to add a little warmth to any outfit. Since Jodie invited me to the party, I thought it would be fun to channel my best Jodie impersonation. I love her style. She's always mixing things up, adding an extra element or accessory, and generally making getting dressed fun. Although this outfit isn't quite bright enough to be Jodie approved, there are some Jodie elements. I started by mixing dressy and casual, something I never would have done in my pre-blogging days. 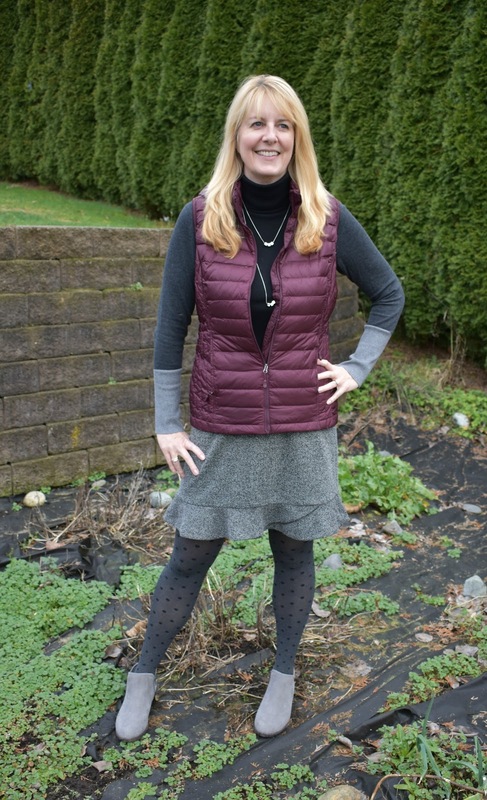 I recently purchased this tweed ruffle skirt from Loft, and thought a little pattern mixing with the polka dot tights would be fun. My husband gave me the side eye when I came out in this outfit -which means it's a success! Be sure to visit the other ladies, as I'm sure they'll have some fashionable takes on this theme. 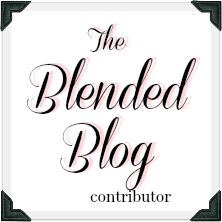 And if you blog, link up with us below. Thank you so much for inviting me this month! YAY for co-hosting today!! Loved this look you put together. You certainly know how to make a girl feel good, Lana!! And I love the vest with the skirt. To me it's the perfect combination....especially with fun tights!! 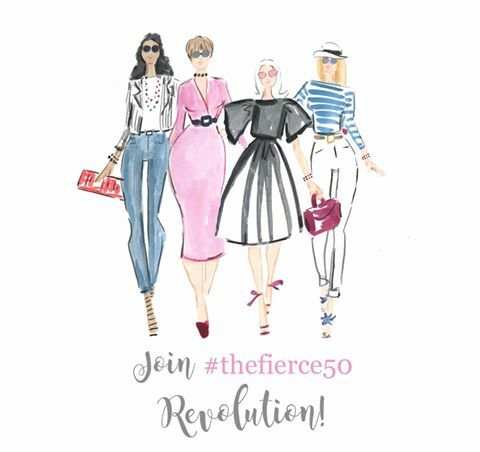 Thanks for joining us...especially on a non blog day for you! Thank you so much for asking me! I need to dress like Jodie more often! I love that skirt! The ruffle at the bottom adds a unique flair. Time to hit up my local Loft! Thank you! They have a bunch of really cute skirts! Haha! Love that your husband's side eye means outfit success! This is such a darling look! Love your fun polka dot tights! Haha - I had to laugh at your husband's side eye! 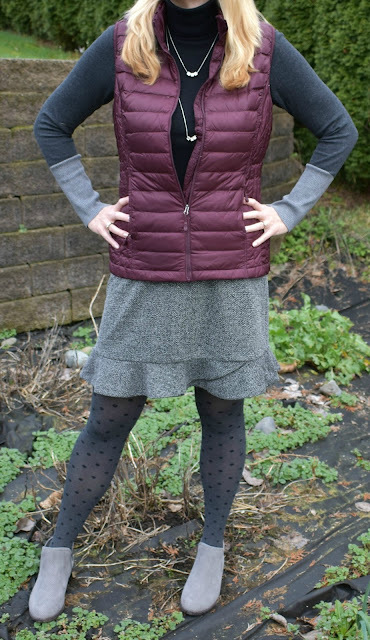 ;) I really like this dressed up take on a puffer vest, Lana! You know I am adoring the tights and I also really like the color combination! So glad to have you join us this month! Thanks so much for having me! I thought of you when I bought those tights. Well Lana, I love your pattern mixing! I haven't yet worn my puffer vest with anything dress yet! Thanks for joining us! Look at you friend..so cute! Thanks for being our guest this month! haha, side eye which means success, that's so funny! You look great, and I LOVE those leggings! He's always giving me side eye - ha!